The Eko Step Bin has a special soft close system. This ensures the bin lid slowly closes down after you remove your foot from the pedal. It has a solid plastic inner bucket which can be easily removed to clean or replace your bin liner. These bins carry a three year warranty and are finished in brushed fingerproof stainless. The Willow Flip Top Tidy Waste Bin is a small bin which is perfect for bench tops. The flip top lid keeps the contents out of sight. Perfect for food scraps. This large flip top tidy is great for big families with a 60l capacity. Swing top lid makes it easy to use and keeps items contained. Made in NZ. This handy 5 litre rectangular pedal bin offers hand-free operation and quiet soft close lid. A very stylish stainless steel accessory to any kitchen, bathroom or ensuite. Its shape offers the ability to fit into a smaller space. This handy 12 litre round pedal bin offers hand-free operation and quiet soft close lid. 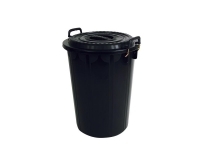 This handy 20 litre round pedal bin offers hand-free operation and quiet soft close lid. A very stylish accessory to any kitchen, bathroom or ensuite. This handy 30 litre round pedal bin offers hand-free operation and quiet soft close lid. 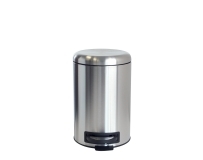 This handy 5 litre round pedal bin offers hand-free operation and quiet soft close lid. This sturdy plastic bin has a two way opening function. The lid can be opened with the foot pedal, but there is also a middle lid insert that opens by the hand release button. Inside there are two handles to help you secure your bin liner or bag. An easy to clean smooth surface makes this a practical choice for the bathroom, ensuite, kitchen or office. The small size and shape makes it ideal for tight spaces in your bathroom, office or bedroom. Available in white or black. This heavy duty moulded rubbish bin has non slip grips and the lid is held in place securely with strong clips. The lid has a moulded handle to enable easy removal. Ideal as an outside bin or use for your weekly collection. Can be easily scrubbed or hosed clean or a liner can be placed inside.